From the apartment you can enjoy a magnificent view over the valley of Tramazzo, the vineyards and the fields sown with plants from the farm. The apartment is on the ground floor of a recently restored farmhouse. In this farm there are two other apartments, each with its own entrance. The sleeping area of this studio is separated from the kitchen with a large closet. 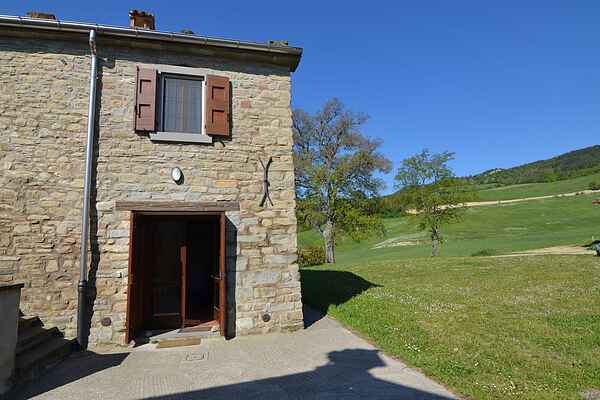 Ideal place to relax and to make long walks in nature.Also an ideal starting point to discover Romagna and Tuscany. Upon arrival you will find a complete linen package that is included in the price. If you stay longer than a week then a linen change is required (10 euros per person per week including towels). Wifi is available free of charge upon request, up to one hour a day.